Full of character and real life, the busy flea markets in Athens, Greece are an integral part of local life. They provide a great place to find bargains or just browse around the wide variety of stalls and enjoy the exciting atmosphere and local market banter. Athens' bustling food and flea markets range from the very large to the small, discreet collection of stalls, situated in small squares. They provide a fun way to shop, for both experienced and novice bargain hunters alike. This lively and extremely large flea market is open every Sunday morning and is full of atmosphere. There are always bargains to be found and traders sell items such as handwoven cloths, bangles, beads, jewellery, trendy clothes, shoes, brassware, silverware, clocks, leather goods, antiques, old books, furniture, general bric-a-brac and much more besides. 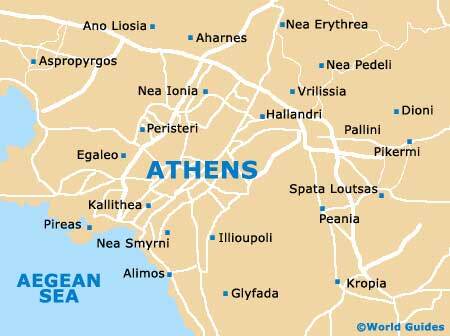 The locals consider the heart of this large Athens market to be in Plateia Avyssinias and its surrounding streets. In the week, the nearby shops are open and also contain many interesting items and are often to as part of the flea market itself. 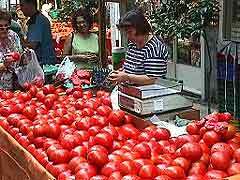 Athens Central Market is held in an enormous market hall close to Omonia Square. The hall itself is actually one of the largest markets halls in the whole of Europe. This popular and busy food market is full of fresh produce and this ranges from fruit and vegetable to seafood and large carcasses of meat. The actual fish market section is quite spectacular, with stall after stall selling seafood, from the smallest whitebait to the largest grouper and tunny fish. There are also many places to eat in the market and in the surrounding streets nearby, all serving tasty food. The surrounding shops are also worth a visit and tend to sell dried herbs, nuts, sweets, fruit, vegetables, game and some household goods. 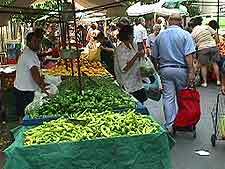 Omonia Station is the nearest Metro stop and is around 10 minutes walk from this market.